Image credit: Kaiser Health News. 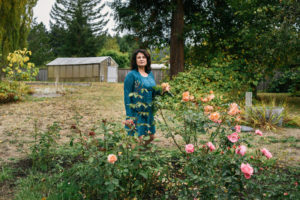 Janet Winston stands in her rose garden in Eureka, Calif. Testing revealed she is allergic to numerous substances, including linalool. Winston still can handle roses, which contain linalool, but she can't wear perfumes and cosmetic products that contain the compound.